M48 The Laura M48 is used on 1976-80 Batavus and ROG mopeds in the US. In Europe and Canada the M48 is also on Solo, and early 1971-73 Tomos, and others. M54 In Europe and Canada, the 1973-77 Laura M54 is on Solex Tenor and others. 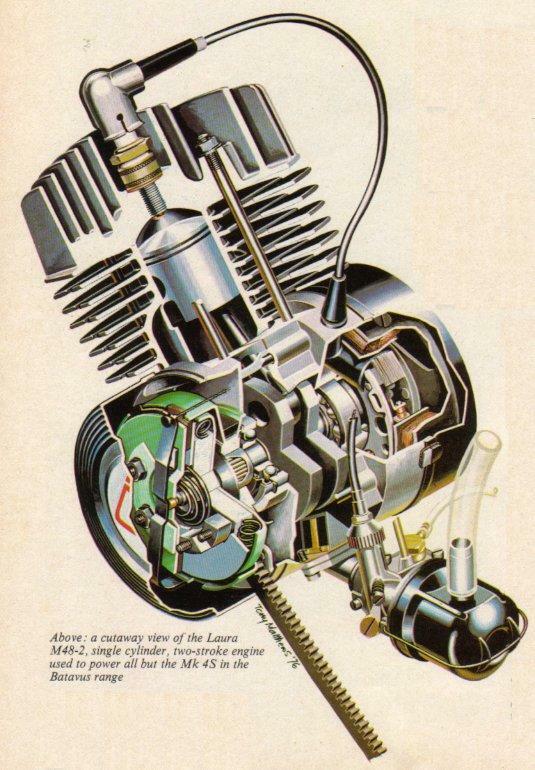 The Laura M54 is basically an M56 top end (piston, cylinder, and head) on an M48 bottom end. M56 The Laura M56 is used on 1978-80 Batavus mopeds in the US, and others in Europe. After 1980 it was re-made in Korea by Daelim Motor Corp. for the brand known as Trac (made by Kia) in the US. The M56 remake was on 1982-86 Trac Clipper, Eagle, and Hawk models. The M56 remake engine is 99% the same. 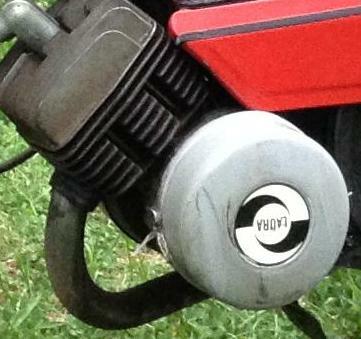 More info about Laura 20, 25, 30 mph speed versions is in the Moped Brands / Holland / Batavus section. The parts list below is made from all three versions (20, 25, 30 mph) of the book at right. 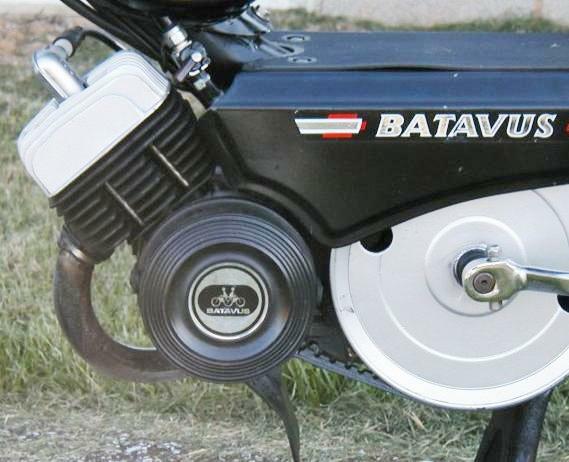 For the M48 models, Batavus dealers were given parts books only for their state’s speed version, and not other state’s. So a dealer in 25mph state like Arizona did not know, and could not easily find out, what parts were different in a 30mph state like California. There were just a few pages that were different. Parts for sale have a price. Green is new, dark green is used. N/A means not available. Many parts are not for sale here, but might be for sale elsewhere. Those item’s prices have a link to click on to get to them. Common things like nuts, bolts, washers, clips, pins, keys, studs, belts, chains, engine hardware, pistons, piston rings, spark plugs, belts, all are listed in their “Parts for Sale by Type” section. Remember the sizes or descriptions given here, when you go there. For example, “nut M10-1.0” has a link to “Engine Hardware” section where you would scroll down to “Engine Nuts” to find that size, 10mm, thread, 1.0mm, height 10mm, and style, regular. 47 823506 6 50¢ case screw M6 x 25? 51 820603 1 50¢ hex bolt M5x?? Small clutch parts: Most of the small clutch parts are in this photo. Top row, #17 840010 tab washer, #4 820502 hex bolt, #5 843500 washer, #6 480981 plate, #61 480892 leaf spring, #22 480887 saucer spring (used), #20 820520 splined bolt. Bottom row, #24 813081 needle bearing, #23 816180 felt ring, #41 490814 washer, #22 480887 saucer spring, #79 480899 washer. Saucer spring: You can see the shiny rings on the used saucer spring. They are where the contact was. The dark areas never touch anything. Leaf spring: The leaf spring goes on any one of the ten tabs of the friction plate, under the basket. What it does is reduce vibration. 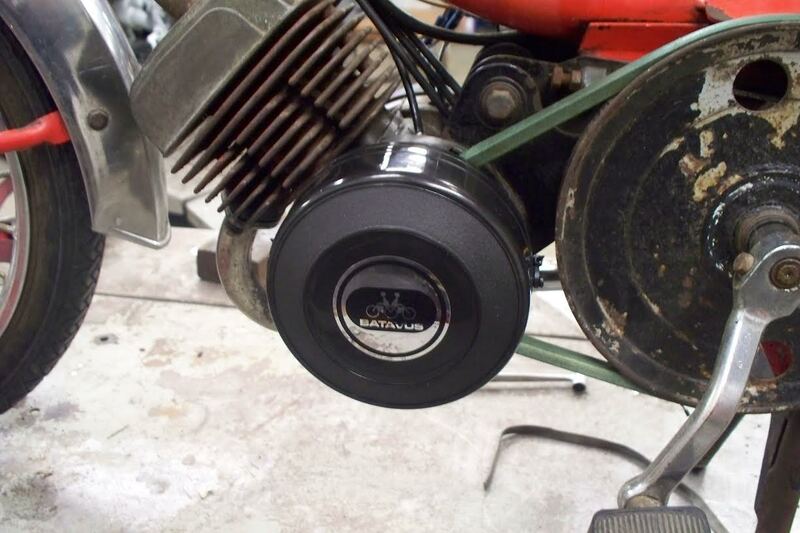 It stops the jingle bells sound, and helps the friction plate tabs last longer. It is not essential, but very beneficial. Crank Seals: Laura M48 uses crank seals that are 1 mm smaller (tighter) than normal. The 15mm right side has a 14x30x7 seal. The 21mm needle bearing case on the left side has a 20x42x7 special seal with an offset lip. 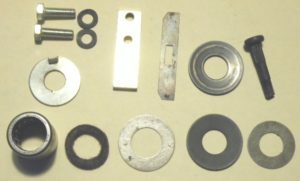 Friction Plate #480889: 10 tabs, each 10.5mm wide, inner diameter 58.5mm, outer diameter 92.4mm (100.4mm at tabs), thickness 3.65mm. Note: The tabs break off when the slots in the basket become worn or notched on one side. This is because not all ten tabs are sharing the load evenly. 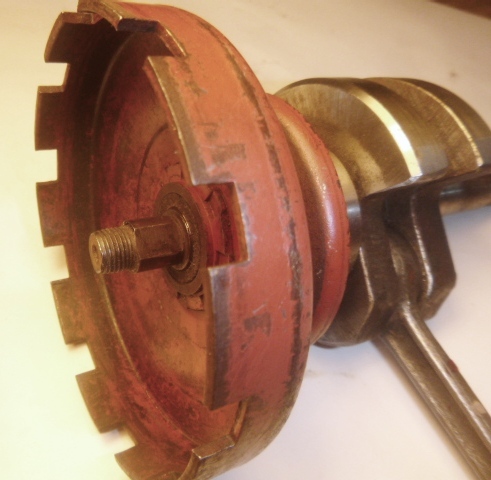 A worn clutch housing/basket also makes the clutch stick and not go into “neutral”. Clutch Housing with Pulley #480880: 10 tabs, 10.3mm wide, ID 94.0mm, OD 98.6mm, center needle bearing ID 15.0mm, OD 21.0mm, length 22.0. Comes with the needle bearing only. Price $150 new, $100 almost new not worn. Far left, a new one and a worn out one. The slots for the tabs get worn wider where the plate tabs push at. Filing those flat will help, but it might still stick sometimes. 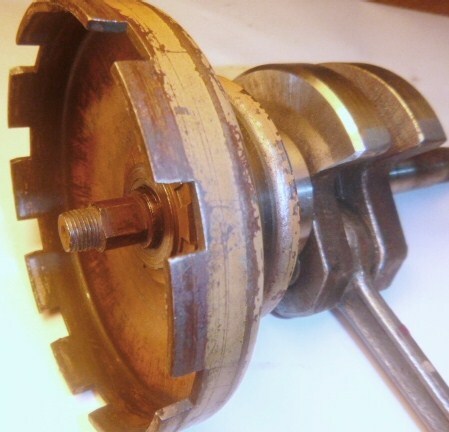 Clutch Washers: The Batavus crank goes from 12mm to 15mm right at the edge of the needle bearing. The clutch needle bearing is lubed by the gasoline and oil mist in the crankcase. The three special steel washers, one cupped, seal the crankcase pressure on the spinning crankshaft, along with the rubber crank seals. First the felt ring #23 goes into a recess in the housing-pulley #71. 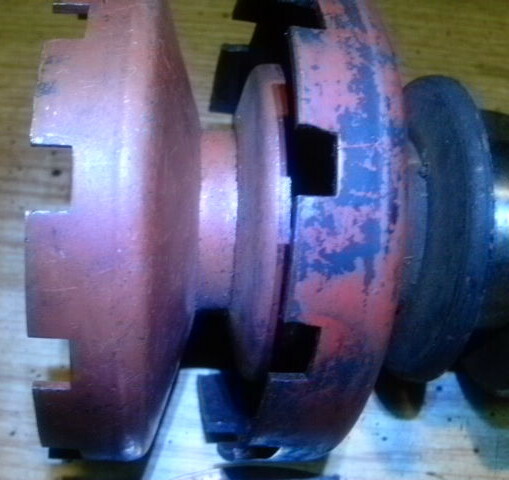 Then the large 15mm washer #41 goes on, just over the 12-15 step in the crankshaft. Then the 12mm saucer spring #22 goes on with the dish side up (outward). Then on 25 and 30 mph versions with the brick red pulley, the 12mm small washer #79 goes on, into the dish of the saucer spring. Then the aluminum clutch hub with large steel saucer in back goes onto the flat sided part of the crank, and rests against the #41. When the outer nut is tightened, the saucer spring is compressed slightly, so that the crankcase is sealed by the metal-to-metal contact ring between #79 and #22. When the engine is running, but the rear wheel is stopped, #79 spins, but #41 is stationary. 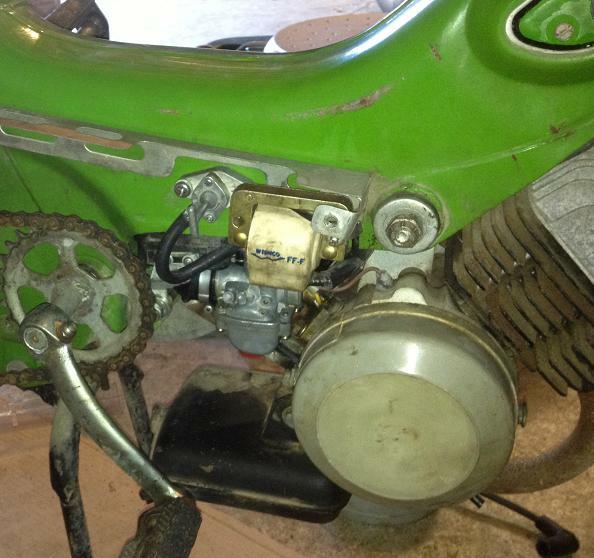 Once the bike gets over 10mph, #41 and #79 are both spinning in sync, so the metal-to-metal pressure seal gets better. 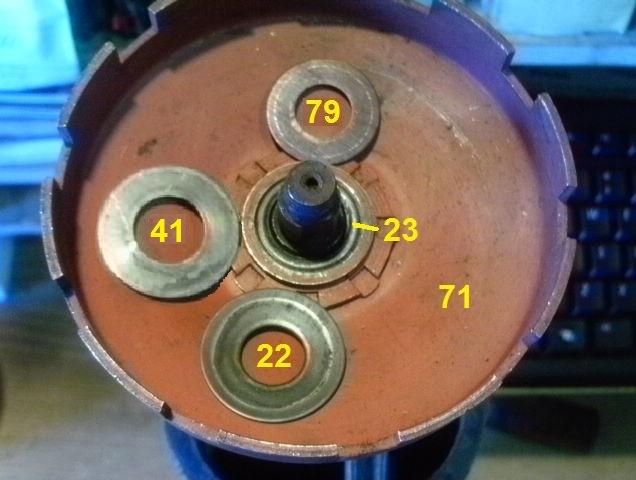 Crankcase Pressure Leaks: All of this special washer business allows the needle bearing to never need greasing. But if a washer is missing, there is a small pressure leak. 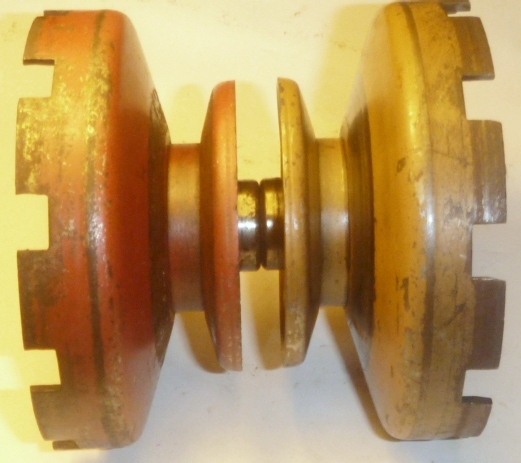 A small crankcase pressure leak causes a small loss of engine power at low speeds. 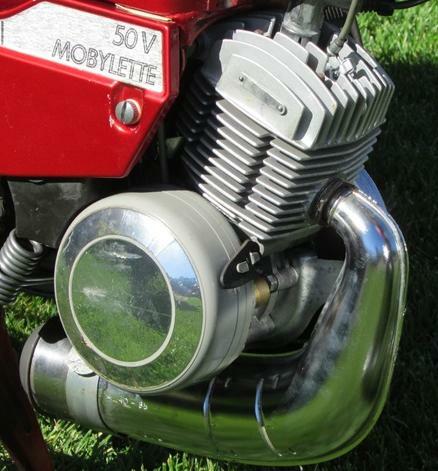 On a two-stroke crankcase the leak alternates in both directions. Piston going down causes some fuel mist to get pushed out. Piston going up causes some fresh air to get sucked in. Then the cycle repeats. Because of the rapid reversal of direction, at low engine speeds the leak has more time to happen, due to inertia. So the effect of leaving out one of the washers is to cause less “low-end torque”. The engine is weak until it gets going fast, then it is normal but lean. There is a small grease seal in the needle bearing #24. But it is not a pressure seal with a ring spring. So it is sealed partially, even without the washers. That is why leaving out the washers only causes a small loss of low speed power. 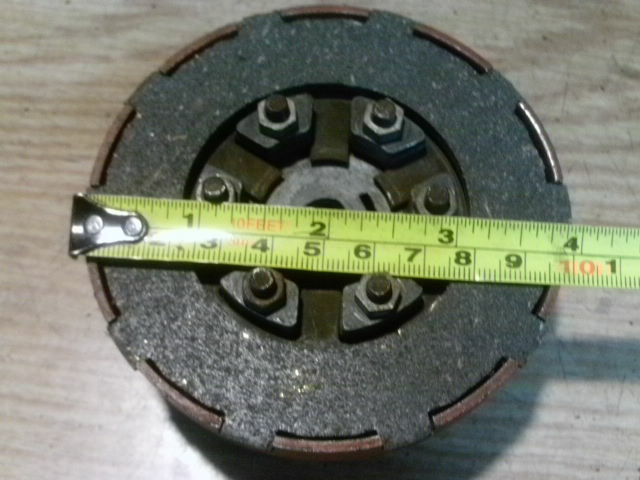 Laura M48 magneto (right) and clutch (left) covers are the same. There are different versions, including aftermarket, and different stickers. Parts for sale have a price. Green is new, dark green is used. N/A means not available. Many parts are not for sale here, but might be for sale elsewhere. Those item’s prices have a link to click on to get to them. 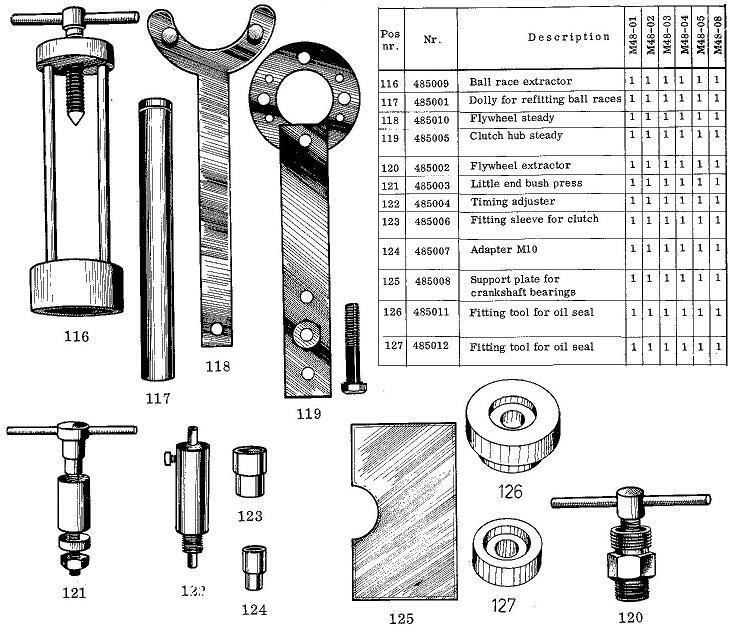 Common things like nuts and bolts are listed in their “Parts for Sale by Type” section. Remember the sizes or descriptions given here, when you go there. For example, “nut M10-1.0” has a link to “Engine Hardware” section where you would scroll down to “Engine Nuts” to find that size, 10mm, thread, 1.0mm, height 10mm, and style, regular. You are currently browsing the archives for the Laura Engine category.